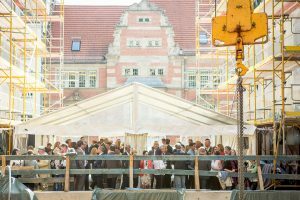 The Artprojekt group celebrated the topping-out ceremony of the Palais Varnhagens, but also the sale of all units last Friday, 13.05.2016, at Französische Straße. 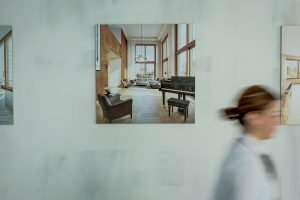 In the heart of Berlin, constructor Thomas Hölzel welcomed numerous guests and representatives from fields of the real estate industry, architecture and media, as well as the builders themselves. 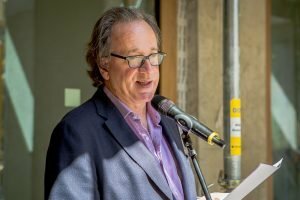 He took the opportunity to express gratitude and to illuminate the origin and significance of the project in the luxury segment. 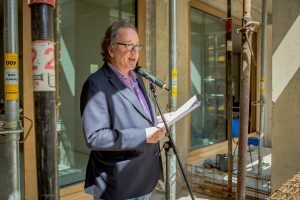 On this basis, Prof. Alexander Schwarz, representatively for David Chipperfield Architects, gave an insight into the architectural backgrounds of the high-quality building. 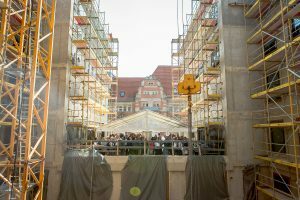 This was followed by the traditional part of the carpenter: The reading of the topping-out speech, the shattering of a glass and the lift of the topping-up wreath above the roofs of Berlin - with live music and applauding audience. Thereafter, the guests let wind down the ceremony with plenty of “meat and drink” and celebrated the completion of the shell together.